Kingfish Ceviche: ponzu dressing, wakame mayonnaise, miso crumb, and fennel. Those looking for the ultimate seafood experience in Hobart head to Mures Upper Deck on Victoria Dock. Take in breathtaking waterfront views through floor to ceiling glass, allowing diners to watch the sky turn pink as they relax with a chilled wine and ponder a fishing line to plate menu showcasing local catches at their best. 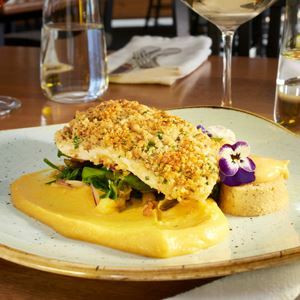 This family owned business has a passion for the sea, from deckhands to Executive Chef the emphasis is on a fresh approach to a la carte dining, plating up starters of miso rubbed lobster tail, pea puree, wombok, wasabi and yuzu dressing. 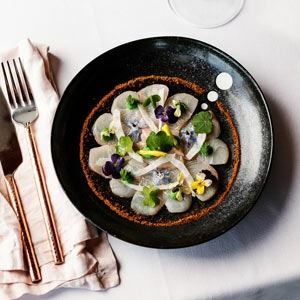 For the main affair be lured by umami glazed ocean trout fillet, local organic mushrooms, dashi puree, ponzu gel and abalone dust; or hook a seafood indulgence plate for two with lobster, scallops, squid, oyster and grilled fish.